Too Cute to Be a Slave??? Ok, let me explain that title. Let me begin by saying that one of my sisters is a professional hair braiders who regularly braids Phillise’s hair. Phillise’s hair is freshly done, so she thinks she is too cute. Apparently, according to her, she’s too cute to play a slave for her Black History Month performance. She, being the little girl that she is (with freshly braided hair, I might add), thought she couldn’t possibly look like a slave. I tell ya’, kids say the darndest things! Saxon Math representatives returned my calls but never followed up or sent any materials. I quickly ruled out Singapore Math because their response to me was, “We’re sorry, we do not send out samples of our products. We have a niche market, so we don’t have to. If you would like to see our product, contact someone in your local area, take a day off from work, & go screw yourself. “Well, they didn’t exactly say that word for word, but that was the gist of it. So, they are definitely out of the running. 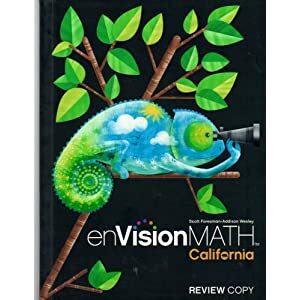 I’m going to go with either EnVision Math (which L.A.U.S.D. uses) or Everyday Math by University of Chicago. Both programs are so complete. They have everything you could need. EnVision has an online component that makes it the frontrunner right now. I’m going to stay after school tomorrow & look them both over before I have to make my presentation to the other teachers. Wish me luck! I’ve Made A Decision on Summer Reading! I spoke to my Principal last night about my inability to narrow my book choices down to only two, she said that I could narrow it down to three. I was so excited. So, knowing that, made it easier to made my decision on summer reading. One of my students is a struggling reader who does not read on grade level. So, before I chose the books, I made sure they were available on audiobook in the Los Angeles Public Library. My fourth graders shouldn’t have a problem, since all of them are reading at or above grade level. As I tend to do, I am still harping on the question that I posted earlier regarding one of my students who is so, let’s say, challenging. As I write this, I am sitting at my desk during lunch time trying to figure out how I could have had more patience with,(let’s call him) Laurence, today. Today, I am embarrassed to report, I taped his pencil to the floor after he dropped it for about the third time during a ten minute period. Once he dropped it, he starts feeling around with his foot, distracting the rest of the group, and kicking me. So, I look at him quizzically. “Umm, what are you doing Laurence?” I asked. “Oh, Miss, I need to get my pencil,” he said. “Ya’ know what?, ” I said. You don’t need to get it because it’s staying down there. Not only that pencil but any pencil you drop, from now on, will also stay down there. With that said, I promptly went to my desk, got the tape and taped his pencil to the floor. I was so frustrated at the time. Now, I feel pretty bad about it. I know hindsight is 20/20, but I’m thinking that maybe I could have ignored it. It’s just that it’s been going on since the beginning of the school year and today, I’d just had enough. Please, can somebody give me some coping strategies to deal with this kid? He’s driving me crazy!!!! Dear Abby, What Do I Do? I have a serious problem. I am seriously short on patience with one of my students. He goes out of his way to annoy everyone in the classroom and ya’ know what, he’s pretty damn good at it. Prett-ay. Prett-ay good. He loves bringing someone to their breaking point. When someone breaks, he smiles. This is what he does. If there are two rows and one is crowded, he just has to go down the crowded aisle and “accidentally” happen to stick out his elbow and hit someone in the face. Another thing he likes to do is break his pencil lead. The other day he “accidentally” broke his pencil lead for the fifth time this week. He does this when he wants to get up and walk around the room. I can hear someone asking if I let him get up and walk around. Well, the answer is yes, yes I do. I even gave him the classroom job of Paper monitor that would allow him to walk around. But, he couldn’t seem to collect everyone’s homework without “accidentally” hitting someone or “accidentally” forgetting to pick up someone’s homework. He lasted for all of three days before I had to remove him for causing too much commotion. I’ve also tried him out as the pencil sharpener. That really didn’t work! I tried him out a classroom cleaner. How do you think that worked out??? If you’re thinking that he “accidentally” hit everyone with the broom, wasted the contents of the dustpan and made so much noise, then you are exactly right!!! Dear Reader, I am at my wit’s end. I DO NOT KNOW WHAT TO DO WITH HIM! Please give me some type of useful advice. Just thinking about going in tomorrow to deal with him makes me want to call in sick. HELP!!!!!!!!!! What Are You Doing on March 2? I am trying to gather some ideas for Dr. Seuss’ birthday. I’ve been looking & am just not satisfied with what I’ve found. Do you have any ideas you can share with me? I’d greatly appreciate them. Thanks in advance. The After Effects of San Juan Capistrano Coming Alive! I am so tired. I love that San Juan Capistrano came alive for my students, but I am feeling the after effects. I am soooooooooooo tired. We did sooooooooo much walking. We took the Metrorail to Union station, then to the Amtrak. Then we walked to the mission. Then we walked all around the mission. Then we walked to the park. Then we walked back to the mission, sat for awhile and made a rope from sisal. However, the Indians made the “real” rope from hemp. The guide, Megan, explained the whole process to us. It was a really involved process. After visiting the mission and envisioning myself in the environment in times past, I suddenly became so appreciative of my current life. Why? It’s because if I would have lived back then, I would have been a slave. Thank God for progress. I love living in our current day and time. I’m still tired though. So, on that note, I will see ya’ next time! I’m taking a nap! I’ll see you when I look at ya’!